Welcome to the 37th issue to subscribers of Right Writing News. If you are reading this issue forwarded from someone, be sure and use the link below to get your own free subscription. It's a challenge to find answers to your publishing questions--especially in these days of form rejections. On Thursday, December 18th, I'll be answering questions through a teleseminar. Besides asking a question, you can receive a sample of my book, Jumpstart Your Publishing Dreams, Insider Secrets to Skyrocket Your Success. This book is available in multiple formats and will officially publish in mid-March 2009 but you can get a pre-release copy. With the right help, you can make 2009 the year to achieve your plans and dreams. I've built such insight into every chapter of Jumpstart Your Publishing Dreams. Head over to http://www.askterrywhalin.com/ and sign up for the teleseminar. Even if you can't attend, the call will be recorded and every registrant will receive an email to the replay of this free event. 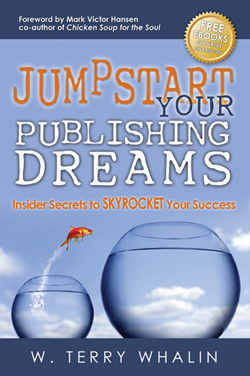 Jumpstart Your Publishing Dreams, Insider Secrets to Skyrocket Your Success by W. Terry Whalin is now available in either trade paperback or Ebook. Visit the website and see what others are saying about this new 280 page book and read a free sample. Officially the book releases in mid-March 2009 but pre-release copies are available. During the last economic recession that I experienced in the early ‘90s when I launched my business, I had a unique advantage that others will have if you’re one of the fortunate ones to make the break and start your business – or if you decide to kick it into high gear. 1. Business is About Relationships-No kidding. People buy from people they know, like and trust. If you’re not focused on building the relationship long-term, you won’t be the success in business you might be otherwise. Starting right now, focus on building the relationship with your prospects and clients. 2. Trust Your Intuition-My dear friend and colleague, Lynn Robinson, has written a great book, Trust Your Gut, and I believe in it wholeheartedly. I recently did just that and felt saved by not investing in an outrageously expensive business program because it didn’t feel right in my gut. Within a few short weeks, another bigger and better opportunity presented itself. 3. Employ VCR – Visibility, Consistency and Repetition-McDonalds may not have the best burger in the world, but what it does offer regardless of where you are on planet earth is a consistent, affordable product – from Tokyo to Boston – you’ll be experiencing virtually the same thing. That’s their major selling advantage that’s packed in consistency – right down to the golden arches. Are you visible in the markets you need to be seen in? Do you present that image in a consistent way and repeat it over time? Coke and Pepsi do too – if one of them opted out of this approach the other would gain market share. What are you doing to ensure your good standing in your market? 4. Provide more Value that What You’re Charging-Under promise and over deliver – works every time. We’re always left with a great impression of someone or their company when we feel that we received a great value for the price we paid. Extend the same experience to all you serve in business and it will come back 10-fold in referrals and repeat business. Remember, it’s always easier and less expensive to retain a client than it is to get a new one. 5. Use a Media Mix-Focus on three or four ways to reach your target market(s) and ideal prospects. There are a myriad of ideas out there that you can put to use in your business, but my suggestion would be that you focus on the activities you enjoy and are good at. E-zine marketing is cost-effective and keeps you in touch with a large number of people. It’s a great leveraging tool and I use it weekly in my business and suggest others do as well. I also attend conferences and conventions where my clients are likely to be. I write articles for trade publications and related web sites where my prospects and clients will read. I do customized direct mail to my A list clientele as well during Chinese New Year and July 4th. There is no one magic bullet to your marketing, but commit to something and implement. 6. Start with the End In Mind -I’ve given you several ideas you could implement in your marketing, however, you need to take the calendar out for ’09 and begin with the end in mind. When would you like to send out a mailing, write a press release and distribute it, contact an editor to inquire about writing an article, etc. Then, work backwards from those dates so the tasks at hand aren’t overwhelming. 7. De-Clutter and Donate What Doesn’t Serve You Any Longer-As we bring in additional bags of goodies during the month of November and December – remember to donate and get rid of things that we no longer need or serve us. It will benefit others less fortunate and give our space some breathing room to allow for new energies to flow through and to you. Getting organized is Key to Marketing Success I don't care how good your marketing and sales skills are, and how good your marketing plan is; if you're not organized, you probably won't implement it. If you can't track your papers, projects, promises and ideas, you are limiting your possibilities. Setting up a system doesn't take long or cost much, but it will pay off for years to come. Get organized for the New Year! 8. Utilize Creativity in All You Do-I can’t emphasize this enough and feel so passionate about it that Debbi Kickham and I co-authored, Off the Wall Marketing Ideas nearly a decade ago and we’re still receiving royalty checks on it for a plethora of ideas on how to employ off the wall marketing in the New Year! 9. Join a Mastermind that’s Focused on Your Specific Objectives for ‘09-If you haven’t read Think and Grow Rich by Napoleon Hill, you must purchase this today (give link for Amazon). He specifically talks about the value of a mastermind alliance and I can’t say enough about making this kind of investment of time and resources to take your business to an entirely new level. Next year, we are launching a private Mastermind Group for only 20 individuals who are serious about earning 7-figures through working with Fortune 500 Companies as Clients and Sponsors of your work. If you’d like to receive an application, contact Misty Allen at misty@growyourbusinessnetwork.com. Please, serious inquiries only, as this program is an investment of five figures for the year. Remember, though, that if you are serious about catapulting your business through working with key decision makers within corporate America. This is the only mastermind program like this. We’re officially kicking it off after the new year, so you’re hearing it for the first time now and we can offer some “creative financing” for those interested. 10. Get Your List in High Functioning Order-You are only as good as your list and your ability to market to that list. We’re in the process of prioritizing our A list clients, product purchasers, professional organizations, media contacts, referral sources, etc. with a customer relationship management expert and know it will make a huge difference in our business next year. You have got to know who you’re best and most loyal clients and prospects are and market to them accordingly. Don’t let the media get you down. Turn off the television and start listening to soothing classical music (or whatever you prefer) and start planning your strategy to tip the scale next year and have a banner year! 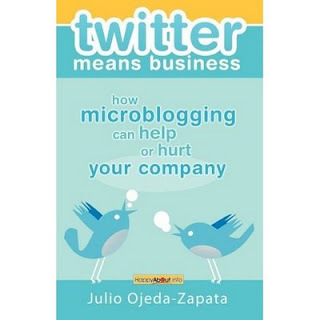 This past weekend, I was reading Twitter Means Business, How Microblogging Can Help Or Hurt Your Company by Julio Ojeda-Zapata. I gave the book a Five Star Amazon review. As I read the book, it hit me that the problem that many people have with Twitter is the name. If you are struggling with this area, then I encourage you to move past the name and use it. You can download the free Ebook, Mastering Twitter in 10 Minutes or Less (use this link) and begin right away. The name of the social media tool, Twitter, sounds like a complete waste of time from the first blush. It's not. Millions of people are using Twitter 24/7 for business. With fascinating detail, Julio Ojeda-Zapata in Twitter Means Business has created a page-turner with plenty of creative fodder to teach readers about the business uses of Twitter. As he explains on page 5, "Twitter means business. That is, a service initially meant for informal communication between individuals has recently become the darling of businesses, large and small. Such firms are finding the "Twitterverse" a fine place to keep an eye on their brands, and what is said about them." If you wonder about the numbers, just look on page 9: "according to site-analytics service Compete, Twitter saw more than 2.5 million unique visitors as of August 2008, a 443 percent increase over the previous year." Throughout the book, Ojeda-Zapata captures the various applications in "Twitter Lessons" which are scattered throughout the book. With little effort, the reader will easily be able to apply these Twitter uses to their own business. I quickly highlighted and flagged my copy of Twitter Means Business. I want to use it as a reference which I will use repeatedly until the lessons in this book become second nature to my own business use of this valuable tool. The one missing piece in Twitter Means Business is a thorough index but this lack can be filled in with a later edition of the title. I highly recommend this book to anyone who is looking to open new opportunities for their business through Twitter. If you have been resisting Twitter and the importance of it, stop for a moment and think about your writing. Does it fall into a particular theme or topic? Like any aspect of marketing or promotion, your use of Twitter will involve consistency and focus. These microblogs are just like a regular blog. With each entry keep your overall purpose in mind--and the audience for that purpose. It will help you attract the right sort of "followers" to your tweets. If you have any hang-ups with the name Twitter, get over it and move past it. Books are classified in many different categories and those categories determine where they sit on bookstore shelves. On soft-cover books, the category or categories are frequently printed in the upper portion of the back cover. Although it's impossible to address the promotion of all categories, in this series of articles, I would like to focus on three types of books: business books, books of faith, and Hispanic/Latino books. I've decided to call particular attention to these books because they represent large, powerful, and emerging markets. Let's start with business books. The term business books covers lots of territory: they are written on a wide variety of topics, including management, leadership, entrepreneurship, strategy, sales, marketing, workplace issues, career building and development, business narrative (a story about a business or what it went through), motivation, and success. Personal finance is a popular major subcategory that includes books on taxes, financial planning, consumer issues, investing, real estate, retirement, and debt reduction. In addition, many general motivation, self-improvement, and how-to books include information about careers and the workplace and some of it may be extensive. For publishers, business books are a most lucrative niche. According to estimates compiled by Simba Information, over 5,600 new business books were published in 2004 and took in over $828 million. The importance of business books is clear from the fact that most booksellers give them so much shelf space and their constant presence on national bestseller lists. Business books even have their own bestseller lists. * Your core market. Clearly identify the main market for your title because business books are not always aimed at all businesses or businesspeople. Your book may target groups such as young professionals, women in the workplace, senior-level management, or specialized niche audiences like financial officers or human resources executives. Focus getting your book covered by the media that best reaches your core market. * Identify companies that could buy bulk copies of your book directly from the publisher. Usually, your best targets will be businesses with which you have established relationships and great contacts. Making volume purchase deals is generally an involved process that takes time. First, you must identify companies that might be interested in your book and the precise people to contact in each organization. Then, you must speak with those people and get them an advanced reading copy of your book before you're passed up the line. * Work out the terms, if they like the idea. It takes time to finalize deals with large corporations who buy in bulk and dealing with their legal and purchasing departments. * Which industry and related groups or associations reach your core market? For example, research trade, industry, professional, or nonprofit associations such as the National Association of Corporate Directors, the Global Association of Risk Professionals or the American Hospital Association, Young Presidents' Organization (YPO), chambers of commerce, and business school alumni clubs. Identify them, find out whom to approach, and then speak to them. Do they hold monthly luncheons or is a conference coming up? If you would like to speak at those events, you may have to set it up months or even a year ahead. Dealing with industry associations and nonprofits can be notoriously slow because frequently, many individuals must sign off on decisions and they can be exceptionally protective. * Do third-party groups exist that might support your book? To publicize Harvey Mackay's book Pushing the Envelope: All the Way to the Top (Ballantine Books, 1999), David Hahn, who has worked with me at Planned TV Arts for the past 22 years, wanted to reach the business-traveler market. He had been successful with the airline in-flight magazines, so he contacted the marketing director for the Admiral Clubs at American Airlines. After a number of discussions, American agreed to place in the front of ten Admiral Clubs across the country a poster of Mackay with his new book. Below the poster sat a fishbowl in which business travelers dropped their cards. Each week, a winner was selected who received a copy of Pushing the Envelope. At the end of the promotion, a grand-prize winner was selected who was flown to Minneapolis on an all-expenses-paid trip where he spent the day with Mackay, did the town, met celebrities, and attended sporting events. This award-winning promotion helped launch Pushing the Envelope onto the best-selling lists for the New York Times, USA Today, Business Week, and the Wall Street Journal, where it stayed for four months. * Who can endorse your book? In business books, endorsements take on added importance because of the credibility factor. Businesspeople tend to have heroes, authors whom they follow, trust, and respect. They are often influenced by their heroes' recommendations and may be more prone to buying the books they suggest. Try to get the right mix of endorsers for your book: big names who have different specialties, experiences, backgrounds, talents, and levels of achievements. Getting the right mix and great endorsements takes planning and time. * How to present your credentials. An author's credentials are of utmost importance for business books. For some other books, they are not as critical. For example, parents will buy parenting books written by other parents if they hear that the advice is sound even though the authors' have no degrees but are just parents. However, neither the market nor the media will pay much attention to business books unless their authors have outstanding track records in their areas of interest. If you, like many authors, have extensive and far-ranging credentials, carefully decide which of them you want to stress to best promote your book. Most authors write business books to establish or solidify their status as experts and deliver their message. They may have a deep commitment to inspire the next generation, give them the benefit of their experience, and enhance the state of the art in their field. Some may want to gain greater visibility for themselves and their businesses. They know that successful books can boost their businesses, advance their careers, launch them as celebrities, and help them earn more money. The authors of business books can be CEOs, top executives, entrepreneurs, business journalists, management consultants, academics, and theorists. Many business books attract devoted corps of loyal readers, so authors such as Ken Blanchard, Tom Peters, and Steven Covey turn out additional books that become franchises. These authors often become highly paid speakers, consultants, and media personalities. If you expect to earn big royalties from writing your book, think again--it probably won't happen. Only a handful of business-book authors make big bucks from their book sales, for instance, celebrity authors like Donald Trump and Jack Welch. The average business book sells only 3,000 copies. However, authors can make tons as a result of their books and the prominence, visibility, and celebrity they bring. Once business-book authors become well established, book buyers admire them. They want to play golf with them and do business with them and will loyally support them. So, these authors get more speaking engagements and consulting jobs for higher fees. Occasionally, a book comes along, such as The Tipping Point (Little, Brown and Company, 2000) by Malcolm Gladwell, which grabbed everyone's attention and has sold millions of copies. Even if the sales of your book are only moderate, authors often find that the publicity surrounding their books enhances their careers, visibility, and business. Reprinted from "Rick Frishman's Author 101 Newsletter" Subscribe at www.author101.com and receive Rick's "Million Dollar Rolodex"
Have you listened to the news lately? It's pretty dismal and each day it seems to increase. I was interested to read my friend Michael Hyatt, the CEO of Thomas Nelson has made a self-imposed media fast. I'm convinced there is another way you can take with your work and your writing. Recently I was listening to Alex Mandossian teach the opening class of the Teleseminar Secrets course. Alex was talking about how this year has been one of his best ever in terms of sales. It's not a story that you hear often but you need to be listening for these gems of encouragement. Cynthia Kersey at Unstoppable.net recently wrote, "Unstoppable people don't believe in failure. They see mistakes as opportunities to learn and develop new skills and strategies, not as failure. Failure implies waste, that nothing has been gained. On the contrary, people can gain much from every mistake and setback along the road to success. Mistakes and failures are inevitable and even essential; they are evidence of action --that you are doing something. The more mistakes you make, the greater your chance of succeeding. Failures indicate a willingness to experiment and take risks. Unstoppable people know that each failure brings them a step closer to achieving their dreams." How can you be unstoppable? I've got several plans in motion for the future which on the surface seem impossible. Often little voices seem to shout inside that I should not be working on such a project. Instead of listening, I plow ahead into uncharted waters because like Cynthia Kersey says, "It's through adversity and failure that we ultimately win. being able to see failure as an opportunity for learning and improvement is critical to becoming unstoppable." I've pulled some information and insight from Guerrilla Publicity. I recently read the second edition of this book and it's filled with applicable information for writers and anyone interested in publishing. Many people would like to delegate the whole publicity area to someone else. They hire a "publicist" for a season or set an advertising budget. With a different mindset and attitude, you can reach more people with less of a financial investment. As the authors explain in the introduction of Guerrilla Publicity, "Most people don't know the value publicity adds to their businesses or how to implement it." You can learn the basic skill of relationship building from these authors who write, "Guerilla publicity works best for small- to mid-level businesses and provides the widest exposure at the lowest price--and it costs far less than advertising and can produce better results. Publicity lets you tell your story in greater depth than advertising, which is crucial for new and unique enterprises." Each chapter of this book contains many insights and critical steps for anyone to build a presence in today's marketplace with the latest cost-effective techniques. Get this book and study each page because it will give you the edge that you need to stand out and succeed. Watch for another entry about some of the information in this book--but in the meantime, be a light in the darkness. It will attract people to your message. Each of us have the same number of hours in our day but some people seem to use them much better than others. Last night I finished reading a book from my friend, Bob Bly which came out earlier this year, Getting Started As A Freelance Writer. A prolific writer, Bob and I have been friends for many years. In April, we were together in New York City and he gave me a copy of Getting Started As A Freelance Writer. I brought the book home and put it on my shelf as a book that I'd like to read--but I did not do it right away. Why? I believe it is the title for this book. I've been writing for over 20 years and I wondered if I needed to read a book about how to "get started." What I discovered is a book which overdelivers and is much more than it appears on the surface. Many people want to know how to begin the journey of a freelance writer. To learn a new skill like freelancing, you are wise to follow someone who has "been there." 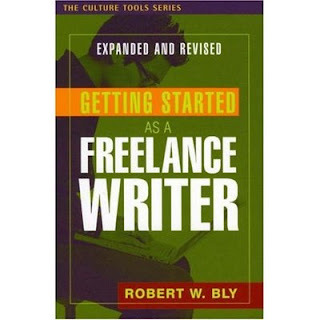 Bob Bly writes with authority and wisdom about the details of a freelance writing career. Whether you are just starting out or have been in the writing business for a long time, you can gain vast insight from this book. The book covers the details of so many issues which concern writers like how to get properly compensated, how to concentrate on the main thing you want to do (write), how to run your writing career as a business (and all of the details), what are the range of possibilities for your writing and how do you grow your business. The information in Chapter 13: Maximizing Your Personal Productivity" is worth the cost of this entire book. Bob gives six keys (and the explanation in the book): Don't do everything yourself, don't shy away from the Internet, don't become addicted to Internet chat, don't get up, don't go out, and don't undervalue your time." (page 170-171). Also Bob includes nine ways to increase your personal productivity. Getting Started As A Freelance Writer is packed with useful information for every writer--beginning or professional. I highly recommend you get this title and study every chapter. I highlighted and flagged a number of pages in this book as I read it cover to cover. First, collect addresses of appropriate publishers by perusing market guides like Children’s Writer’s & Illustrator’s Market , industry newsletters such as Children's Book Insider, and looking through similar books at the store or library. Then send a self-addressed, stamped envelope to the publisher asking for writer’s guidelines (you can start this process while you’re still writing your book as it may take a few weeks to receive a response). Review the guidelines carefully to make sure your manuscript fits with what the publisher is looking for. Most publishers want to see the entire manuscript for picture books. Type your manuscript on white paper, double spaced, indenting at the beginning of each paragraph. Use at least one inch margins on each side, and justify the left margin only. Put your name and the title of the book at the top of each page, and number the pages consecutively. Your name, address, phone number and email should appear in the upper left-hand corner of the first page. Center the title of the manuscript about a third of the way down on page 1, skip a line, and then start the text. Don’t break the text up into pages as it would appear in the finished book, and don’t include illustrations unless you’re a professional artist (in which case, send a black and white dummy with a sketch of each illustration and 2-3 copies of finished color illustrations along with the typed manuscript). Send with a brief cover letter stating the title, intended age group, and word count of the story. Add any previous publishing experience and memberships to writing organizations (if you don’t have such experience, leave this section out). Mention if this is a simultaneous submission (sending the manuscript to several publishers at once), and include a self-addressed, stamped envelope (SASE) with enough postage to return the manuscript if necessary. For longer fiction, publishers often want a query letter and sample chapters. The query starts out with the same basic information as the cover letter above, but also includes a brief synopsis of the plot. Try to write the query in the same style as the manuscript, and include information on the main characters, the conflict and the resolution of the plot. Add your publishing experience, and tell the editor you can send the entire manuscript if she’s interested. Ideally, the entire query letter will fit on one page. Send with the first two chapters of the manuscript and a SASE. For longer nonfiction, a book proposal is generally requested. This gives a brief overview of the book (one or two paragraphs describing the tone and slant of the information), and a chapter-by-chapter outline (with a sentence or two listing the information covered in each chapter). Attach the first two chapters if it’s requested in the writer’s guidelines, and also a bibliography of your resources. In your cover letter, list the target audience, the estimated length of the finished manuscript, why your book is different from others on the market on the same subject, and your expertise on the topic. Send with a SASE. Nonfiction picture book publishers may require a query (in which case you’d outline the book in one or two paragraphs and also include the information from the nonfiction cover letter above), or the entire manuscript. If sending the whole manuscript, attach a brief cover letter as with fiction picture books, but also mention how your book fits into the current market and your credentials on the topic. Following the proper submission procedures gets easier with practice, and ensures that your manuscript will get a serious look. Take the time to give each editor exactly what she wants, and she’ll give your work closer consideration. Note: For much more information on writing cover letters, query letters and book proposals, see Author to Editor: Query Letter Secrets of the Pros, edited by Linda Arms White. It includes over 30 actual queries used by authors to sell everything from picture books to young adult nonfiction. Go to http://write4kids.com/a2e.html for all the details. Copyright 2008, Children's Book Insider, LLC.